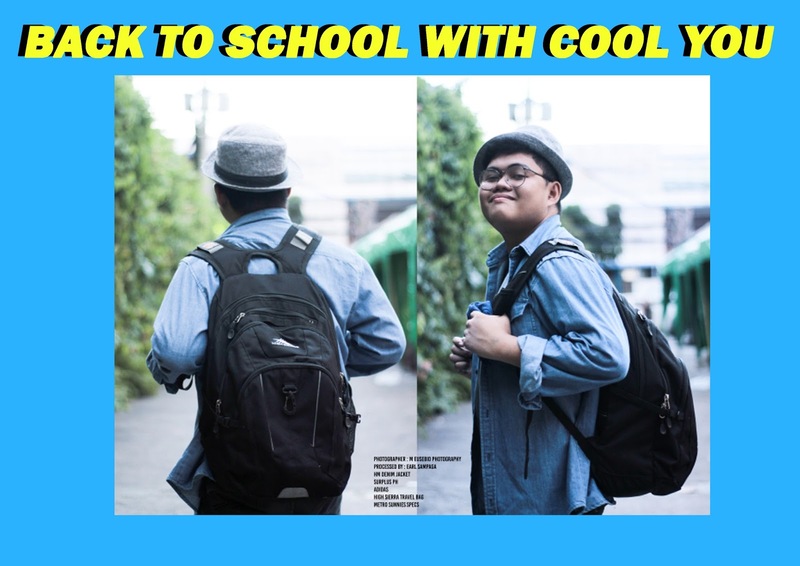 BACK TO SCHOOL WITH COOL YOU! The school year is officially opened here in the Philippines and some of the students are lazy to attend school and a bit tired saying ” Summer is not yet over! ” while other students are so excited to meet their teachers, classmates and to do school works . Now, I’m gonna share you guys my Back to school #OOTD tips, tips on how students can survive a stressful school year ? So let’s get started!! As a student, I used to wear affordable school stuff yet guaranteed of its high quality because I’m not just checking the price but also checking its quality and style. For school shoes, I recommend Salvatore Mann ( available in all participating malls nationwide). The quality of the shoes are great and awesome because it’s made of leather and can’t be easily damaged . I also started using Salvatore Mann shoes since 7th grade because it can be also used for fashion purposes and it’s comfy! For school bags, I use High Sierra Backpack ( available in malls nationwide) I super love this bag because it is not just a school bag but it can be also a traveling bag or hiking bag. The storage of the bag is big and it can load up to 8 kg. Whenever I go to school, it carries my big laptop, my heavy books, notebook and so much more . Best also for Mountain hiking and Traveling . For eye wears/ specs, Try Metro Sunnies ( available in participating stores and authorized online shops ) . I recommended this one because the lenses are replaceable and it is made for #ootd yet affordable and good to wear. also it’s comfortable to wear. So that’s it! You can be cool while studying right? School works and activities are just normal for students but we can be stress less if we do the right thing so that we can survive the school year. Nowadays, Teachers are asking students to do online assignments, digital projects and etc. So i recommend to use Laptop and Educational Apps. The system properties /specs are very important in buying a laptop for fast and good performance. Use Adobe Photoshop to edit ,make a collage for your school activities and crop photos professionally . Use Adobe Premiere and After Effect for video filming tasks and video presentations. Use Adobe Light room to fix the color and tone of your photos for projects and school works! Easy and cool Right? For sure you will be the best digital artist in your class! We need to do time management to avoid stressful school days. Do plan schedules to avoid conflicts. Do advance school works so that you can do other important things. Do review in advance when exam is fast approaching to get high grades. Do go to the library if there’s free time in your class. Do all your home works so that you can sleep early. Don’t waste time in order to avoid time conflicts. Don’t do gala/ hangout if it’s not that unnecessary. Don’t do home works in your school it should be on your home not on school. Don’t watch T.V. or browsing the internet if it’s late at night. I hope you will not be late in passing your requirements and school works ! Stay active and lively when it comes to recitation because it can help to boost your confidence and not to be stressed out. Reviewing and advanced studying can help to improve our intelligence and knowledge about the subject. Approach your teacher if you don’t know the lesson so that you can catch up and stress less. Also when it comes to examination , just pray, focus and do your best so that stress would leave you. So that’s it! I Hope that you will be less stressed and stay cool this year. Good luck to your studies and God bless this school year!